Mark your calendars now. This year’s spring football game on April 23 is a can’t-miss event for any Wisconsin fan. Already a popular event each year, the 2011 version of the spring game promises to be better than ever, especially considering the anticipated competition at quarterback. Credit the philanthropic thinking of UW athletic director Barry Alvarez and head football coach Bret Bielema for the improvement. For the first time, the UW Athletic Department will charge admission to the event, something Alvarez and Bielema have discussed doing for years. The cost will be $5 per ticket, with all proceeds going to the University of Wisconsin School of Nursing. “This is a wonderful opportunity for the School of Nursing,” said Katharyn May, dean of the School of Nursing. “Fundraising right now is a tough sell, and the nursing school has been working on raising sufficient funding to build a new home for more than a decade. Alvarez announced the ticketing plan Monday afternoon at Wisconsin’s weekly head coaches press conference. In doing so, he also shared a couple stories about how the idea came about. During his time at Iowa under legendary head coach Hayden Fry, the Hawkeyes annual spring game featured free admission, much like its Wisconsin counterpart has for years. Despite no cost, attendance at the event remained low. But Fry had an idea to get more fans to show up. Last spring, Iowa drew 23,502 fans for its annual scrimmage, compared to the crowd of 23,567 that watched the Cardinal squad defeat the White, 25-3, at Camp Randall Stadium on the same sunny afternoon. But those numbers still put Wisconsin well behind the leaders nationally, which include a couple Big Ten rivals. At Nebraska, the 2010 Red-White game was watched by 77,936 fans. In Columbus, despite poor weather, the Buckeyes drew a crowd of 65,223 at Ohio Stadium. Football is by far the most popular sport in the United States, and the growing attendance for spring football games — which mean precious little in the grand scheme of things — is the perfect example of such popularity. With tickets being in such high demand, it should come as no surprise that so many schools now charge for these annual intrasquad contests. What is remarkable, however, is the decision of the UW Athletic Department to charge admission without keeping any of the proceeds for itself. Now you may be wondering how Alvarez and Bielema decided the game would benefit the School of Nursing, considering how many other programs on campus could be equally deserving. As it turns out, it was a matter of excellent timing. On the very same day that the two had decided to charge admission and contribute the proceeds to one of the departments at the University of Wisconsin, the School of Nursing held an event with Alvarez in attendance. In talking with May and a number of others in the nursing program, Alvarez learned of their excitement regarding a capital project that would provide a new home for the School of Nursing and allow it to increase enrollment by 30 percent. Coming off their most successful season in more than a decade, which saw the Badgers go to the Rose Bowl for the first time since 2000, it would be safe to assume the annual spring game would see a jump in attendance. Even with a cost of $5 for admission, Wisconsin could expect its biggest crowd yet for the Cardinal-White scrimmage. That being the case, it also would have been easy for Alvarez to charge the money and take the proceeds for the Athletic Department, which could use some added revenue to keep up with the other major Division I programs in the nation. Instead, Alvarez and Bielema saw the opportunity to do something bigger than themselves with the spring game. In allowing the School of Nursing to run the event and collect the proceeds, the football program will have a direct hand in furthering the education of some of the university’s best and brightest students, including a number of its athletes. Despite being in the midst of the greatest nursing shortage in recent history, the School of Nursing has been forced to turn away three students for every one admitted, making it the most competitive program on campus. With the added fundraising now available through the spring football game, enrollment could increase within two years. If everything goes according to plan, with high attendance at the spring football game and additional funding from the state of Wisconsin, the School of Nursing hopes to break ground this fall, with the new building to open by Fall 2013. Just how close are they to the necessary funding? Well, now that the word is out, it’s up to Wisconsin fans to come through and uphold their end of the bargain. Can you spare $5 to support the School of Nursing while spending a beautiful spring afternoon watching a football game with thousands of your closest friends? If you can, I’ll see you there. PASADENA — Asked how tough a two-point loss in the Rose Bowl was to deal with, J.J. Watt took a moment before answering, trying to collect himself and his thoughts. “We know how much this means,” Watt began before his emotions got the best of him. Teary-eyed, Watt attempted to regain his composure and finish his answer. “To everybody. To everybody involved,” Watt continued, his voice now audibly revealing the fact that he could not stop from crying. Another deep breath, as some sniffles now accompany the tears. Finally, it was all too much for the junior defensive end. Watt sat back, and covered his face, attempting to hide the tears streaming down from his eyes. For seven seconds, everyone in the room sat silent, watching the display of emotion from Watt, and waiting for him to finish his answer. Watt did not, and could not finish his thought at that time. But he didn’t have to. If there were any question about how devastating a two-point loss was after working so hard to get to the Rose Bowl for the first time in more than a decade, Watt’s tears made it clear. The Wisconsin Badgers didn’t come to the Rose Bowl just for the experience, they came to win, and fell short of their goal. Moffitt, having played his final game in a Wisconsin uniform, summed the loss up pretty well, by not summing it up. How can you put into words the disappointment that comes from such a heartbreaking loss on such a big stage? It wasn’t supposed to be this way. Despite TCU’s status as the three-point favorites, the Badgers were billed as big, bad BCS team ready to end the Horned Frogs’ run. Cinderella stories, by definition, are supposed to end when the clock strikes midnight, not make the game-winning play on the two-point conversion well into the early morning hours. But therein lies the problem, TCU is no Cinderella. Even so, that hardly takes the sting out of the loss for Wisconsin. They put together one of the best seasons in program history, but came up short when it mattered most. They’ll always own a share of the 2010 Big Ten title, but the 2011 Rose Bowl belonged to the TCU Horned Frogs. But through the disappointment and frustration, the tears and the anger, the Badgers remain focused, and focused on the same thing that got them to the Rose Bowl in the first place. Wisconsin is prepared to take this loss, evaluate it, learn from it, and get better heading into next season because of it. Even Watt, who had broken down just moments earlier, was not going to sit and sulk. 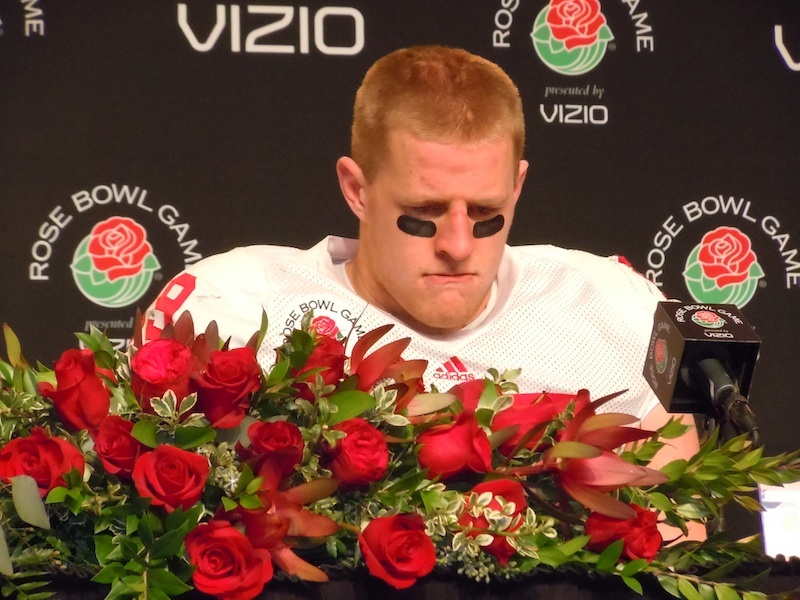 “The Wisconsin Badgers will be back to the Rose Bowl,” Watt said definitively. “I haven’t made my decision, but if I’m back [or] if I go, the Wisconsin Badgers will be back to the Rose Bowl. I don’t know if it will be next year, but Coach Bielema is an outstanding football coach, the Wisconsin football program does things the right way, and Coach Alvarez leads the athletic department the right way. PASADENA — Many times, in talking about what his team did to get to a share of the Big Ten championship and a Rose Bowl bid, Wisconsin head coach Bret Bielema went back to their Oct. 2 loss at Michigan State. As he saw it, Bielema’s team managed an 11-1 record with big wins over then No. 1 Ohio State and on the road at Iowa because of what they learned from the Badgers’ loss to the Spartans. Had it not been for that game, they wouldn’t be where they are today. Ironically enough, nearly three months later, the issues that cost Wisconsin in its only regular season loss were much the same problems they had in the Rose Bowl against TCU. The Badgers couldn’t get off the field on third down and left plenty of points on the board through missed opportunities in the close loss. From the beginning — literally as Montee Ball ripped off a 40-yard run on the first play from scrimmage — the TCU defense struggled to stop the potent Wisconsin offense. It was the Badgers themselves that did most of the work in keeping points off the scoreboard. Unfortunately for the Big Ten champions, they followed Ball’s big run — which brought them form their own 32-yard line to the TCU 28 — with a false start penalty on Nick Toon. When the drive came to an end, the Badgers put three points on the board on a 30-yard Philip Welch field goal, which came on 4th-and-8 at the 13-yard line. On the previous play, Toon added a second mistake, dropping a pass over the middle. Had he not been called for the false start penalty, however, the Badgers would have been in a 1st-and-Goal situation on that series, rather than 1st-and-10 at the 15. Tolzien, normally as efficient a quarterback as you’ll find, went just 12-of-21 for the game, passing for 159 yards while getting sacked twice. On their first drive of the game, Wisconsin left a potential touchdown drive out there, but managed to salvage it with a field goal. When they opened the second quarter with another long drive, they weren’t so lucky. After moving the ball down the field from their own 23-yard-line to just outside the red zone, Wisconsin faced 4th-and-3 at the TCU 22-yard line. 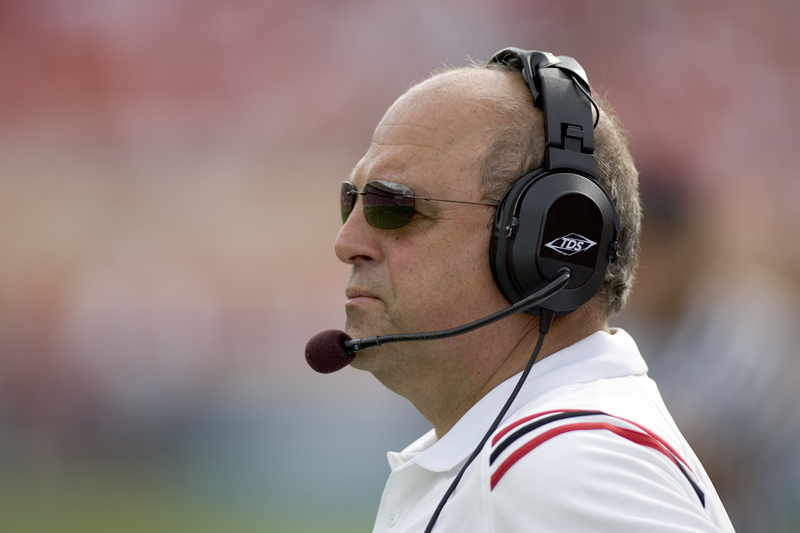 Trailing 14-10, Bielema sent Welch out once again for the 39-yard attempt. He missed it, wide left, for another three points left on the board. The missed opportunities and sloppy play were not limited to the offense, either. A pass interference call on Devin Smith played a role in TCU matching Wisconsin’s early field goal with a 10-play, 77-yard touchdown drive that took less than 4 1/2 minutes off the clock. Later, on what was perhaps the worst pass of the day from TCU quarterback Andy Dalton, free safety Aaron Henry couldn’t come up with what could have been a game-changing interception. On the first play following Welch’s missed field goal, a pass intended for Jeremy Kerley went through Henry’s hands over the middle. While he broke up the pass effectively, it was a very catchable ball for Henry. Whereas the Badgers continually missed out on opportunities and left plenty of points on the board, the Horned Frogs always seemed to make the right plays at the right time. In the end, that made a big difference in a game decided by just two points. MADISON — One of the biggest debates since the Badgers earned a Rose Bowl berth has been focused on the distribution of carries among three running backs. Do you go with what’s working in Montee Ball and James White? Or do you rely on your veteran running back John Clay, who just happens to have a Big Ten offensive player of the year award to his credit? Wisconsin head coach Bret Bielema may have answered those questions Sunday night, when he met with reporters. Well that sure seems to clear things up. Or does it? With three weeks remaining until the Rose Bowl, it would not be out of the question for Bielema to change his mind and put Clay in the No. 1 spot. After all, he did say “right now” when referring to Ball as his starter. While all three running backs have clearly expressed their support for one another, they never stop competing for carries. The idea that they have to work in practice to touch the ball in the game is not lost on the players either. Another thing that people can’t help but notice when looking ahead to the matchup with TCU is the potential for Wisconsin to have as many as three backs with 1,000 yards rushing on the year. White leads the way with 1,029 after another big performance against Northwestern, with Clay and Ball not far behind. Even after missing so much time, Clay needs just 64 yards to give the Badgers a second 1,000-yard rusher. Ball’s chances aren’t as strong, but 136 yards certainly is not out of the question for the sophomore. When you consider he’s rushed for 127, 167, 173 and 178 yards against Purdue, Indiana, Michigan and Northwestern, it would almost be a surprise for Ball to come up shy of the mark. Add his apparent status as the starting running back and his chances certainly improve even more. It’s not really something that he’s focusing on, though. In an ideal scenario, a big first half by Clay and the Badgers could give Wisconsin a big lead, with two of three backs over 1,000 yards on the year. If that were to happen, how would those two running backs feel about deferring to Ball, to let him become the third to reach the milestone? Bielema was not so quick to embrace the idea of boosting Ball’s carries to get him to the 1,000-yard mark. With his focus on winning, and not just playing in, the Rose Bowl, he expected to do whatever was needed to win. MADISON — On a day when the Wisconsin offense put up 70 points, it was defensive end J.J. Watt that stole the show. Quite easily, too. Watt showed off his relentless motor Saturday, wreaking havoc on the Northwestern offense as the Badgers won 70-23 to clinch a share of the Big Ten title. Anyone who watched would have had a tough time not being impressed by the Pewaukee, Wis., native. For the game, Watt recorded seven tackles. All seven were solo tackles, as he did not record and assist and any tackles in the game. Watt was credited with one sack, for a loss of 12 yards, while recording three tackles for loss, for a total of 19 yards. He also added three quarterback hurries. With his performance, Watt easily put his name in the conversation for Big Ten defensive player of the year. “J.J., at his position, with what he’s done for our defense, I can’t say there’s anybody in our league that’s been comparable,” head coach Bret Bielema said. Watt showed those instincts and his ability to anticipate throughout his dominating performance on Saturday. In the first quarter, NU quarterback Evan Watkins was intercepted by Jay Valai on the Wildcats’ second play from scrimmage. Watt had one of his three quarterback hurries on the play, forcing a bad throw from Watkins. On the Wildcats’ next drive, following a three-and-out by the Wisconsin offense, Watt sacked Watkins, while also stripping him of the ball. Tyler Dippel recovered the fumble for Wisconsin, and the Badgers punched it in for a touchdown on two plays. When Northwestern got the ball for the first time in the second quarter, trailing 21-3, quarterback Kain Colter was intercepted by Mike Taylor at the Wisconsin 32-yard line. Taylor picked up 47 yards on the return. Once again, Watt forced the bad throw as he picked up a quarterback hurry on the play. Late in the first half, Watt tackled Watkins following a 21-yard pickup, separating the quarterback from the ball, which allowed Aaron Henry to recover the football with 2:55 to go in the second quarter. “I was just trying to have some fun,” Watt said of his performance. “It’s the last game of the year in Camp Randall, I’ve got to give our fans a little bit of a show. Our offense obviously put on a big show, so on defense we had to put on a show as well. Watt capped things off in the second half with one of the plays of the game. In the third quarter, Northwestern scored on a 20-yard touchdown pass to cut the lead to 40 points at 63-23. On the extra-point attempt, Watt came up with the block, his third of the season. “We’re always taught to give 110 percent every single play,” Watt said. “If they’re going to kick an extra point, that’s a point on the board that we don’t want to have. MADISON — For the past two decades, Wisconsin has always been a run-first program. Over the last few weeks, the Badgers have been running wild, while opponents had little hope of stopping them. On Saturday, when they needed a win to clinch a share of the Big Ten title, it was the passing game that really made the difference offensively. In his final home game, senior quarterback Scott Tolzien delivered one of the top performances of his career. “Scott’s a guy that takes advantage of every opportunity, every play,” UW head coach Bret Bielema said. “He made a tremendous check there at the line of scrimmage on that last deep ball to David [Gilreath], that was all him. Tolzien passed for 230 yards and four touchdowns on the day, while connecting 15 times on 19 pass attempts. He found five different receivers on the day, including four passes apiece to Nick Toon, Lance Kendricks and David Gilreath. For his four touchdowns, Tolzien connected with Toon twice, while finding Kendricks and Gilreath for one score each. Kendricks led the way with 80 yards receiving, while Gilreath added 75 and Toon had 62. Kendricks’ four-catch performance came in less than 30 minutes of play, as the senior tight end left the game with an injury following his 29-yard touchdown reception with 3:14 to go in the second quarter. Tolzien finally came out of the game himself following a timeout in the fourth quarter, earning a big ovation from a packed house at Camp Randall Stadium. When his name was announced during the pregame Senior Day festivities, he drew even bigger cheers. With his performance, Tolzien had a passer rating of 250.1, which marked the fifth-best single-game pass efficiency in school history. On the season, Tolzien has a rating of 169.8 while completing 74.3 percent of his passes. After running back Montee Ball got things rolling with three first-half touchdowns to put Wisconsin up 21-3, Tolzien delivered the next four touchdowns for the Badgers.